Forms and permits for various NRD programs can be downloaded below. All files are in PDF format. see Nitrogen Certification & Water Conservation Training for information and test requests. New agendas show up on the Sparq Data Meetings site automatically as they become available. Archived minutes from 1999-Present are available for download in PDF format below. NRD publications can be viewed/downloaded below. Downloadable files are in PDF format. 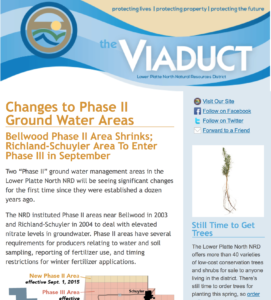 The Viaduct is the newsletter of the Lower Platte North NRD. A print version of the Viaduct is distributed twice a year (winter and summer) in area newspapers. An email version is also sent to our mailing list subscribers (enter your email below to join!). The Lower Platte North NRD publishes an Annual Report each winter summarizing accomplishments from the past fiscal year. The report is inserted into area newspapers, including the Columbus Telegram, the Fremont Tribune, the Schuyler Sun, the Wahoo Newspaper, and the David City Banner Press. Approximately 30,000 copies of the report are distributed through these newspapers. See our Annual Reports in our Viaduct Issues! The Lower Platte North NRD uses a Long Range Implementation Plan as a planning tool for future projects and programs. The Plan is updated at the end of each fiscal year (July 1-June 30).The plan summarizes district activities for the previous fiscal year and lists objectives for the upcoming fiscal year. The plan also contains long-range objectives for the next five-year period. The Hazard Mitigation Plan was developed as an update to the 2010 Lower Platte North NRD Multi-Jurisdictional Hazard Mitigation Plan. In compliance with the requirements of the Disaster Mitigation Act of 2000, this plan was created in effort to identify and profile hazards, identify people and facilities at risk, assess for threats and potential vulnerabilitiy, and identify strategy and mitigation measures. The development included direct participation from thirty-three jurisdications and in-direct participation from one village and five public school disticts. Lower Platte North NRD will be starting the process for the next update in 2018.